In Tearing Haste – letters between Deborah Devonshire & Patrick Leigh Fermor Edited by Charlotte Mosley. The title of this book is a catch-phrase by Sir Patrick (but call me Paddy), Leigh Fermor in his letters to Deborah (Duchess and a Mitford) of Devonshire I can confess to unadulterated adoration for Paddy, so this review is written from a rosy-glowed perspective, but then who would be churlish enough to admonish me on that count! 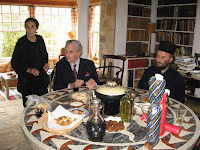 I had the pleasure of meeting Paddy (pic right with neighbours) on his Name Day, 8 November in 2007, in his own home on the idyllic Mani coastline on the outskirts of the small village of Kardamyli - a small seaside settlement littered with olives, stately cypress and a few magnificent yellow-stone homes. Just like Paddy, I fell into love with Kardamyli the moment I stepped off the bus, and it was with joy in my heart that I read his letter to the Duchess of Devonshire describing the moment he and his wife Joan found the site where they would build their home. I have memories of waiting for the bus out of town late one evening, watching two Adonis-like local lads who ran a small bar, playing chess under a low yellow light on a small front porch near the bus-stop. Further along, another bar, where early evening, troglodyte men (they don’t wax in this part of the world, thank goodness), returning from a hard day’s labour, would gather of an evening to sip, yes, sip, their beer, or their frappes (extra long strong coffees), and talk… or across the road, under a canopy of grapes where women in cardies or head-scarfs, sat outside, maybe with their bicycle’s nearby, sipping local wine, or perhaps an ouzo. The letters between the Duchess and Paddy are funny, endearing, laced with relatively harmless gossip and lashings of genuine affection, one for the other. The Duchess writes to “Darling Whack or Paddy” from her castle in Lismore, Ireland, or from the Chatsworth Estate and he writes to his “Darling Debo” “in haste”, or “in tearing haste” from mainly the Mani, but also a train (not rapido), Corfu, Hydra, and Africa. The Duchess is of course, one of the inimitable Mitford Girls and Sir Patrick Leigh Fermor is a dashing war hero feted in both Greece and Germany, and most well known for his to date, some would say, unrivalled travel writing about Greece, in particular, and pre and post war Europe. The letters are populated with a wide range of characters from royal and political circles (the Queen Mother is known as “Cake”), to the more humble but more interesting characters whom Paddy encounters on his many sojourns. Some highlights, by way of excerpts, to tempt you. “He drinks like Hell, starting at breakfast, and goes through his part in a sort of miraculous trance.” Of Errol Flynn - “He poses as the most tremendous bounder – glories in being a cad – but is intelligent, perceptive and, in a freak way, immensely likeable.” And of Somerset Maugham – “He is 83, and his face is the wickedest tangle of cruel wrinkles I have ever seen and so discoloured and green that it looks as though he has been rotting in the Bastille…”, (it goes on, and gets worse, but I won’t spoil it). This light-hearted banter is threaded throughout their exchanges and even more intriguing are the quizzes Debo sets Paddy, such as. “What are …Heart of Oak, Hue & Cry, Dan’s Mistake?” – which as it turns out, are all gooseberries, and then another letter where she lists the peculiar names of sheep giving an insight into her preoccupation with the Chatsworth Estate and all things agrarian. I got a bit cross with the Duchess when she kept insisting, as if it were a trifle, that she still hadn’t read any of Patrick’s books. At first I thought perhaps she was joking, but then it seemed she really had not. But her attitude is nicely summed in this extract from a letter around the time that the Duchess herself became a published writer… “I must say I’d rather write a book than read one any day. Not so sure about the victims who are supposed to read mine.” And in another letter she laments trying to find a first sentence for her second book, and wonders what ‘The Dear Reader’ will think of “louping ill, orf, yellowces, scrapie, fluke foot rot, worms and under clap…” Although, Paddy takes a keen interest in her writing efforts, proof reads some of her work and proffers editorial suggestions. The letters are a testimony to an enduring affection between two very privileged people who share a passion for life, a lack of pretension, an appetite for joy and a shrewd sense of human foibles, with humility and huge humour. But more than anything, this collection of letters only whet my appetite to know more about Sir Patrick Leigh Fermor and his wife Joan, who appears to have been a highly independent character in her own right, unfazed by her dashing husband having so many adventures, both with and without her. Having said that, although I’m not remotely interested in books about stately homes, my grudging admiration for the Duchess of Devonshire might tempt me, if I stumble on the book ever, to perhaps take a peek (recognising that she won’t mind at all, if I don’t).